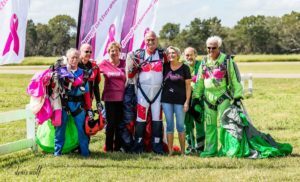 A very special group of ladies at Skydive Spaceland in TX, organized a very pink 3-day skydive and community action event, Jump For the Rose (JFTR). In its fourth year, the event spearheaded by Marian Sparks – a breast cancer survivor, was designed as a way to give back. In 2009, Marian found herself divorced, without insurance and with breast cancer. By luck she was steered to an organization in Houston, TX, called The Rose. All her medical needs were taken care of with expertise, grace and without any cost. She told her doctor, she would find a way to repay the groups’ kindness. In 2010, she founded the non-profit organization, Jump for the Rose (JFTR). When Marian handed Dr. Dixie Melillo, also the Medical Director and Co-Founder of The Rose, a check after her first skydiving fundraiser, the good doctor was floored. She had never expected Marian to follow through with that promise. “Dr. Dixie,” now makes the annual trek out to Spaceland to participate in the weekends’ activities and talk to the participants. Because of her tireless activism, Marian’s name was submitted to the Susan G. Komen foundation to be one of their “survivor” representatives. Her beautiful face has now been featured in countless commercials and print ads. She has found her calling! Several jumps were also made with teddy bears that would later be donated to children undergoing cancer treatment – a “brave bear” for a brave patient. A big part of this year’s theme was “inclusivity.” No girl left behind. In one of my favorite jumps of the weekend, we invited novice jumper Nicole, who had only 28 jumps, to join us on a 15-way multiple point dive. Putting her in the base between highly capable formation veterans, she became the central focus of the group. We formed a beautiful formation and everyone got to see her grin from ear to ear. She was still grinning as the weekend wound to a close with some persistent rain showers. It was a thrilling reward for all to help a new jumper achieve a milestone and join the fold! A women’s Vertical Formation Skydiving 4-way Head-Up state record was set – participants were: Merriah Eakins, Katrina Shows, Nicole Black and Alex Neale. USPA Judges Christy Hitchens and Randy Connell were on hand to certify the new Texas state record. During the afternoon weather holds, two major indoor attractions were held. The multiple award winning film, Pink Skies, was screened followed by Q&A and a breakout session on breast cancer prevention for the participants. World renown aerial cinematographers, Norman Kent, gave a talk on several of his most noted projects including the recent HTC commercial – http://www.youtube.com/watch?v=dwGGdM3Nj08. He also showed clips of his amazing skydive sequence in the film Get Smart and his awe inspiring aerial work with a falcon. Locals set up a mobile kitchen and made authentic Cajun Gumbo in a big iron pot. Everyone gifted and contributed their talents, time and energy to make this heartfelt event a big success.